Here, kiteboarders, windsurfers, and surfers dance across the waves. Intrepid explorers gallivant through the tropical flora on foot, horseback, or ATV. And when the sun goes down? We all meet on the beachfront to clink glasses, dance bachata, and share stories. Paradise is waiting in the Dominican Republic. Travel to Cabarete: Via STI, POP, or SDQ. If you’re headed to the North Coast, you have 3 decent airport options. Puerto Plata (POP) is only 30 minutes from Cabarete. Santiago de los Caballeros (STI) is about 90 minutes through the mountain pass. The capital city of Santo Domingo (SDQ) is 4-5 hours by car or bus. Depending on where you’re flying from, one of these airports is often significantly cheaper than the others, so be sure to check them all. If you’re bringing your own adventure gear, don’t forget to check the luggage requirements of your airline for restrictions and peak season embargoes. Taxi prices are a bit steep in the DR, with travel to Cabarete being anywhere from $35-200 depending on which airport you’re coming from. If you’re feeling a little more adventurous, the bus is the most affordable way to travel locally. My friends at Hotel Villa Taina have created a comprehensive guide on travel from the airports to Cabarete. 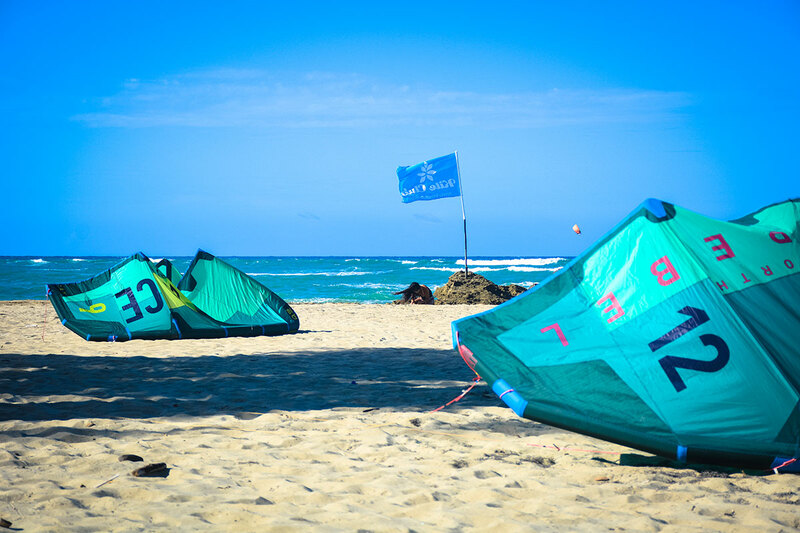 Your destination: Kite Beach, Cabarete. Photo by Crystal Veness. 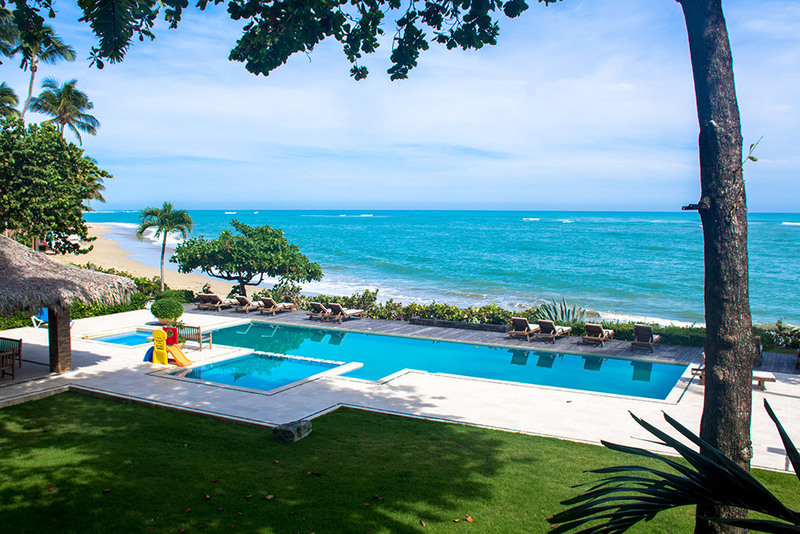 Where to stay in Cabarete, Dominican Republic. From hostels to hotels to vacation rentals, there’s something for everyone. Honourable mention goes to Natura Cabana, a boutique hotel with a jungle vibe and access to a stunning little stretch of beach. This is the place to go for barefoot luxury. If you’re a kiteboarder, the beachfront hotels at Kite Beach and in the town of Cabarete might be the best place to hang your hat… and wetsuit. But with warm, Caribbean water year round, you won’t need one! Save that space for bikinis and board shorts – you’ll definitely be needing those. AirBNB is chock full of private rentals that will give you a bit more of that ‘at home’ feel, because what’s better than feeling at home in paradise? The Hostel Laguna Park is your budget option. It’s set back a ways from the beach, but the best place to meet like-minded solo travelers, especially if you’re not a kiteboarder. ‘Motoconcho’ may seem like a strange word, but it’s one that will become part of your vocabulary pretty quickly in Cabarete. A motoconcho is essentially a motorcycle taxi. You can hop on the back of one of these bad boys and they’ll take you anywhere you want to go. The going rate for anywhere in town is 50 pesos per person in the daytime, and 100 pesos per person after dark. If you’re going for a longer ride to the surf beach of Encuentro or the flatwater playground of La Boca, be sure to negotiate your price in advance. 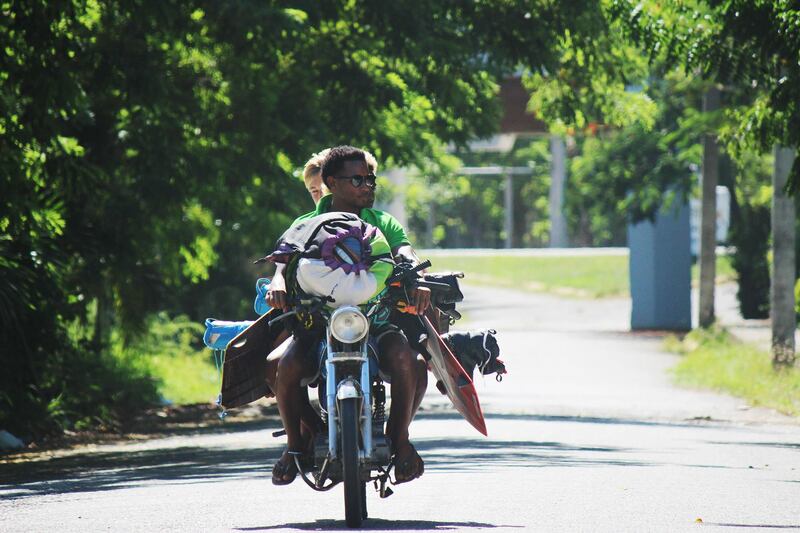 Yes, you can carry your boards on a motoconcho! Motoconcho adventures in Cabarete. Photo by Crystal Veness. If it’s rainy or you’re up for riding like a local, a guagua or carrito is a fun way to ride. Think of these like a hop-on hop-off trolley, except they’re old, creaky cars and vans. Other than on foot, these are the cheapest ways to get around Cabarete. Just flag one down and hop on in! Here’s a helpful guide from Cabarate Palm Beach Condos on public transit in Cabarete. If you’re a road warrior, rent yourself a scooter! Those that come to Cabarete and stay for several months often buy a motorcycle and re-sell it before they leave. One word of warning: this highway is not for the faint of heart. If you’re not an experienced, cautious, and aware driver or rider, I would recommend against this option. If you’re looking at getting out of town to explore the coast, you can pick up a rental car or SUV on Cabarete’s main street. Check with your hotel to find the best rental operation. There is much more to see on the North Coast than Cabarete, and renting a vehicle is a great way to expand your adventure. Eat, drink, and be stoked! 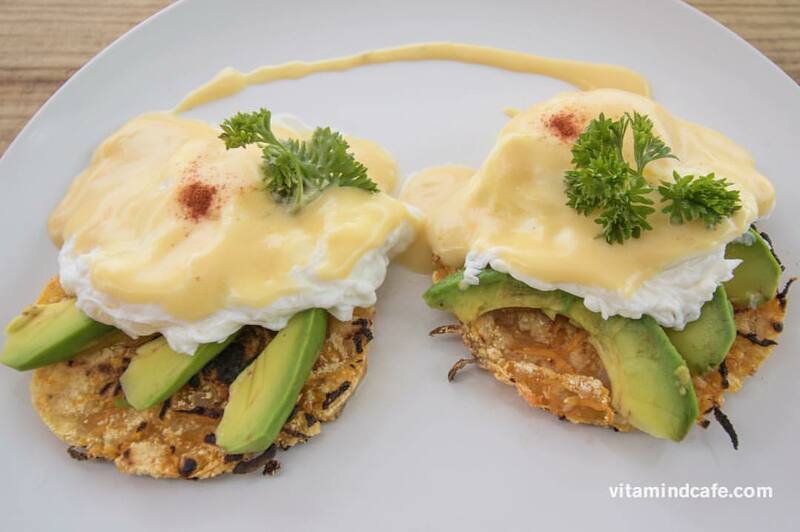 Eggs benedict that will make you feel awesome! Photo by Vitamin D Cafe. This is the spot to watch the action go down on Kite Beach. Open for breakfast and lunch, their menu is super healthy and their WiFi is blazingly fast. This is the place to go for vegan, gluten free, sugar free, and dairy free food options. Nothing beats feeling healthy on your holiday! Hidden gems – These spots don’t boast that beachfront view, but your taste buds will thank you for the visit. Vagamundo is a coffee and waffle spot with an extensive selection of liege waffles and craft coffee any way you want it. If you love yogurt and honey and happiness, The Honey Company is heavenly. Cheap eats – If you time it right, you can take advantage of the half price food menu at Lax Ojo, where pizza and pasta is half off. If you stick around til the late night scene starts? This is the place to go for the party! A couple doors down is Mojito Bar, which is known for it’s daily sandwich and mojito special. This might just be the best deal in town. Either way, you can’t go wrong with these beachfront bargains. Pizza pizza – La Chabola down El Callejon has reportedly the best pizza in town with a half price menu and regular live music. Pizza & Spaghetti House on the main street of Cabarete is another contender for best pizza. Their burrata appetiser is delightful. You might just have to try both spots to see which one takes the title. Treat yourself – A fancy dinner in Cabarete isn’t going to break the bank. If you want something special, Cabarete is not short on quality eats. Otra Cosa is a quiet, sparkling restaurant at the end of the bay that has a French and Asian flair. Bliss cooks a mean steak and their chocolate souffle-esque dessert will make you melt. Yalla is the ideal spot for a group to share a glass of wine and a selection of tapas. Natura Cabana‘s restaurant is the best place for ambience and a mind-blowingly delicious chef’s tasting menu. Take a look at some of the selections in the video below… You can’t miss this one! Now for the good stuff… things to do in Cabarete. There’s certainly no limit to the adventures you can find in the Dominican Republic, but here are some of the best ones specific to the Cabarete area. Kiteboarding – Cabarete has been a kiteboarding hotspot for decades. This was one of the sport’s original spots, and continues to draw visitors from around the world. 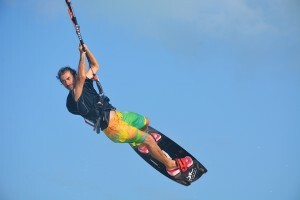 If you’re a new or aspiring kiteboarder, check with Dare2Fly kite school to book your lessons. For the experienced riders out there, well… chances are you already know all about this spot. Where to go when the wind blows. Photo by Crystal Veness. Surfing – Encuentro is the most popular surf beach on the North Coast. 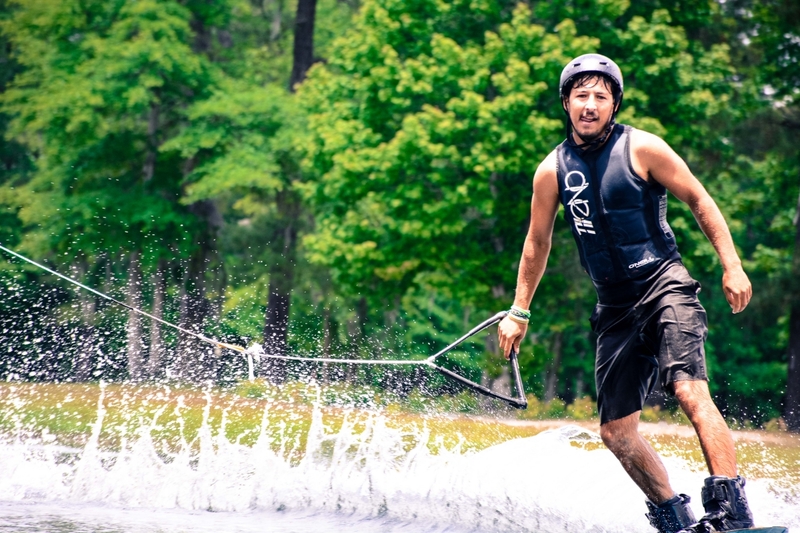 Beginners and local pros come together here to shred some serious gnar. And by together, I mean on the same beach… not the same wave! The beautiful of Encuentro is there are waves for learners and there are waves for the pros, and with everyone respecting the right of way rules, there is endless fun to be had. Be sure to ask around at the surf shacks to get the lay of the land. LG Surf Camp and Bobo’s Surf School are great places to rent boards and take lessons. Horseback riding – This isn’t your average horseback ride on the beach at sunset- though that’s certainly an option here. If you’re looking for an adventure on horseback that will eclipse your average vacation ride, contact Rancho Luisa y Tommy. They have a half day experience that includes traversing rivers, galloping across the plains with mountains rising up behind you, and a much-needed break at a local colmado (shop) for a cerveza for you and some water for the horses. 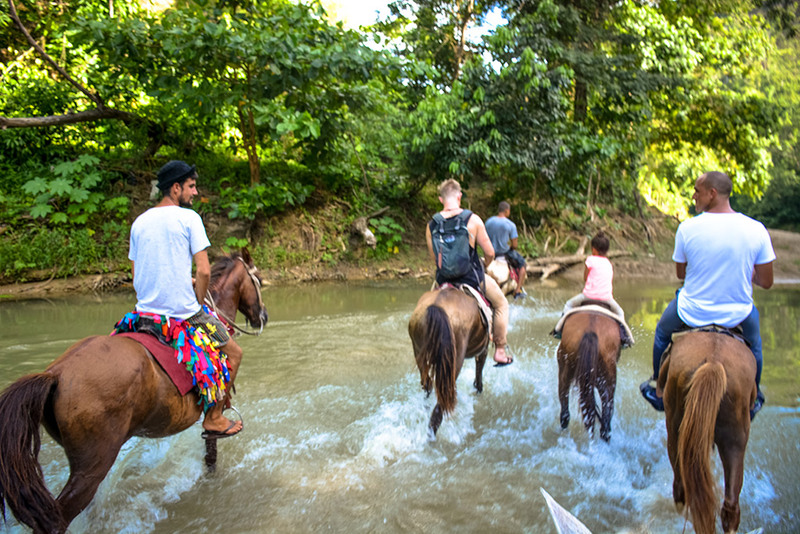 A horseback adventure to remember! Photo by Crystal Veness. River float – Here’s an adventure for the crew. Brandon Sanford of Dominican Surf Trips hosts a river float tour that is all sorts of fun, especially when the wind and waves aren’t working. It includes everything from transportation to floats to snacks to ‘hydration’ (a.k.a beer and rum). This is a great way to spend a warm day with your friends and let loose in the jungle! Canyoning – Ready for something next-level? Hiking, climbing, rappelling, and cliff jumping… these canyoning tours are for the true adrenaline junkie. If you’re afraid of heights, skip it. But if you love a challenge and a unique perspective on the Dominican Republic, this is your rodeo! Check out your options on this post from Cabarete Palm Beach condos. If you’re looking for some mini-adventures, hop on a motoconcho and visit Las Cuevas (the caves), take a latin dance lesson, get centred with some yoga, hit one of the local gyms, do a kickboxing class, or tranquilo with a sunny afternoon of sipping beverages in the pool at Milennium. Cabarete can keep you entertained for months! Adventure til the sun goes down… and then keep going. Photo by Crystal Veness. Cabarete is a place that can start to feel like home very quickly. This is a Caribbean trip that you can take on a budget, or blow out of the water. 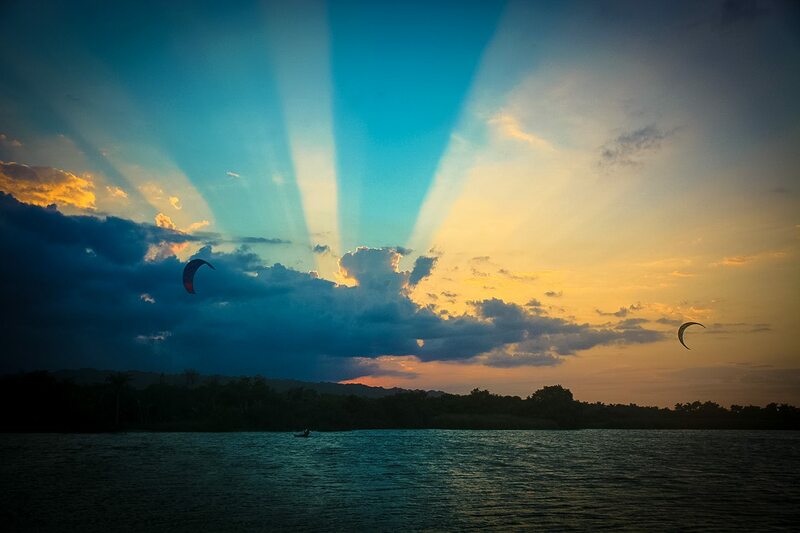 Whatever you bring to Cabarete, you will leave with memories in spades. If there’s one thing I can suggest for your trip: don’t miss a sunset. The best place to be when the sun goes down is outside. And sunrise? Worth waking up for! Every day is an opportunity for another adventure in Cabarete. If you have any questions about your trip or want to share any favourite spots, get in touch on Facebook or Instagram! I’d love to hear from you.